Volunteers are being sought for the Earth Day Cigarette Waste Clean-Up on April 21. This event will help clean and beautify CSUN. Photo by David Hawkins. 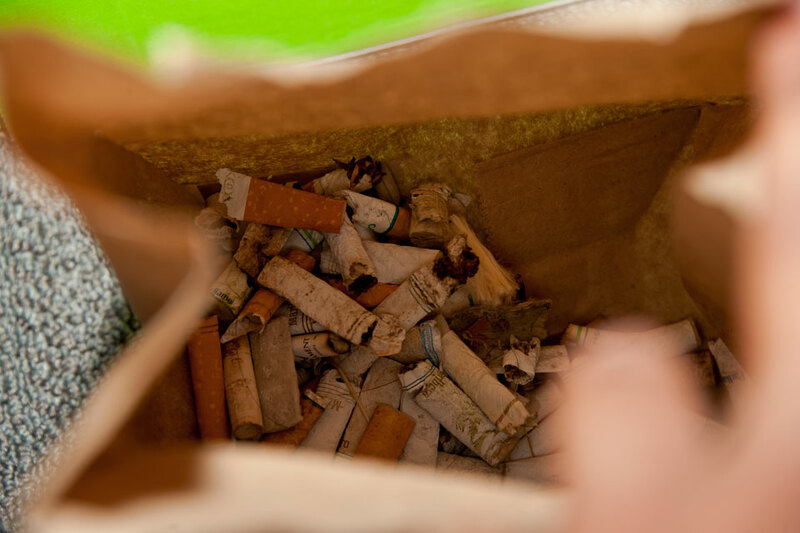 At the 2015 clean-up, more than 18,000 cigarette butts were picked up and disposed of. Photo by David Hawkins. As part of this year’s Earth Day celebration, Health Promotion and the Clear the Air Advocates will host a Cigarette Waste Clean-Up Day on April 21, and the California State University, Northridge community is invited to take part. CSUN’s Clear the Air campaign, which launched at the start of the fall 2015 semester, has been a dramatic success, but cigarette butts are still occasionally found throughout campus. Students, faculty, staff and community members who would like to volunteer to help clean up the waste can do so in one-hour shifts from 9 a.m. to 4 p.m. on the day of the clean-up. Anyone wishing to participate in the clean-up will receive a free T-shirt, gloves, collection bag and drinking water. To sign up, please RSVP to Susan Krikorian, health educator at the Klotz Student Health Center, at susan.krikorian@csun.edu.